This luxury gold variant of the Gear S3 Classic smartwatch comes for a lower price than expected - those interested can get the 24K gold-plated wearable for $599 USD thanks to De Billas. Those who like to cover their gadgets in gold and were looking for a gold-plated Gear S3 Classic can grab a custom, luxury edition of this smart wearable from Amazon these days at an excellent price. 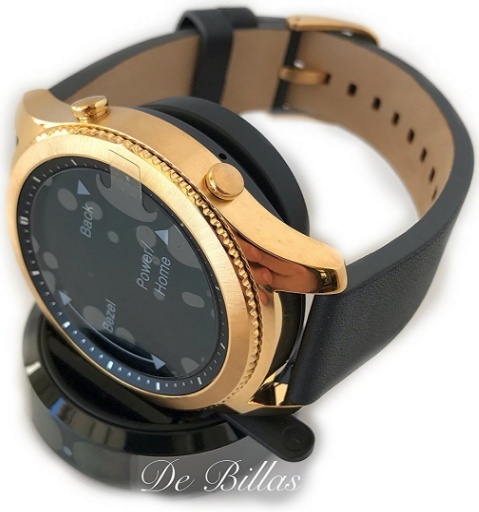 Arizona-based gold-plating specialists De Billas have the 24K Gear S3 Classic listed on the company's website for $659 USD, but on Amazon, it starts at $599 USD. According to De Billas, they also provide the gold plating treatment to the charger in the package for no additional cost. The watch itself is treating only using gold, without any nickel involved. "We DOUBLE plate all of our items with a high thickness and industrial grade of genuine 24K Gold. The immersion process utilized deposits a beautiful layer of real 24K Gold. We do not apply nickel to our gold plated items." The Gear S3 Classic with the leather band also has the buckle plated using 24K gold. For some extra money (currently $779 USD as listed by De Billas, down from a regular price of $899 USD), one can also choose to have the gold-plated Samsung Gear S3 Classic with the Links Band entirely covered in gold as well.